This Ham, Egg and Potato Breakfast Casserole combines shredded potatoes, chopped ham, eggs, cheese and lots of vegetables to make a hearty and comforting breakfast or brunch. I have such a hard time naming recipes like this one. I started with the basics. This is a breakfast casserole. That part was easy, but totally not descriptive enough. There's ham, the protein, so that should be in the title. And there's loads of potatoes in there, too. Ham and Potato Breakfast Casserole! Sounds good, no? But I felt like I should mention the eggs. They're the binder. Yeah, got to mention the eggs. But wait. I can't not say that there's cheese. 'Cause I love me some cheese. Cheesy anything is a winner. Okay, so now I'm at Cheesy Ham, Egg and Potato Breakfast Casserole. Ah, I forgot the mushrooms! I am in love with mushrooms and everyone who reads the title should know that there's mushrooms in this gorgeous casserole. 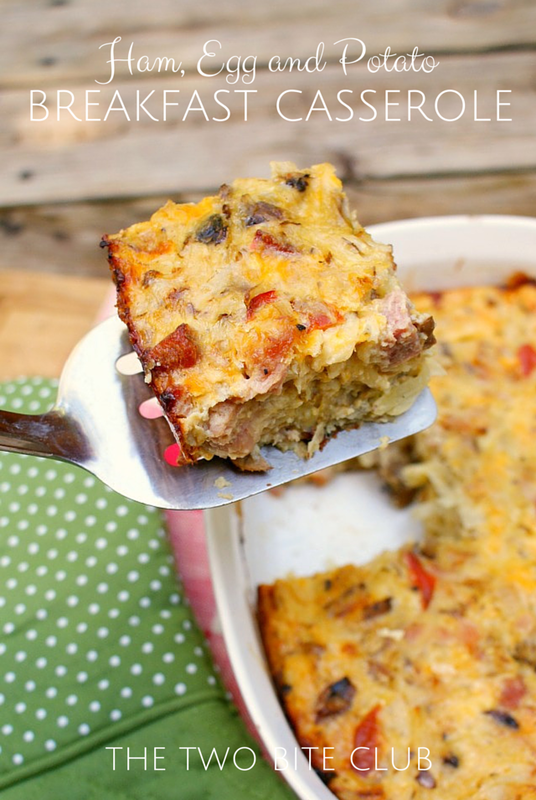 Cheesy Ham, Egg, Potato, and Mushroom Breakfast Casserole. That's a mouthful. Haha. Are you seeing my problem here? TMI? Yeeeeaaahhh. Short and sweet, Becky. Keep it short and sweet. Apparently, short and sweet is not my strong point. So you see, I spend way too much time on the title. It's tough, I tell ya. I finally whittled this one down to the three main components: ham, egg and potatoes. But enough about a name! Let's talk about why this recipe rocks. It's a breakfast casserole. Portion it for breakfast for the week and reheat or serve to a crowd. There's two kinds of cheese: cheddar, the expected, and cottage cheese, the unexpected! There's a lot of potatoes in this one! 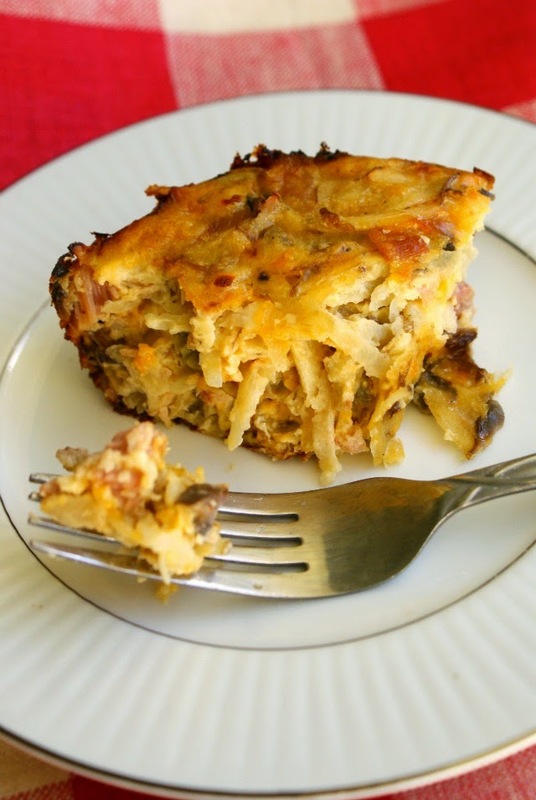 It's kind of like a beefed up (or hammed up, if you will) hashbrown casserole. Hashbrown casserole, egg casserole hybrid. It's delicious and you'll love it! Enough said! Heat the oil in a large skillet and saute the onion, bell pepper, mushrooms and garlic until the onions are translucent. Season with salt and pepper. Set aside to slightly cool. In a large bowl, whisk together the eggs, cottage cheese, and cheddar cheese. Stir in the ham, shredded potatoes and sauteed vegetables. Pour the egg mixture into a greased 2.5 quart casserole dish. Bake for 45 minutes in the preheated oven. I did not peel my potatoes. I like the rustic, earthy flavor the skin has, but if you prefer peeled, that'd work, too! Adapted from Jeanette's Healthy Living. This sounds so good with all of the cheese, mushrooms, and potatoes! I think I'd made it for dinner and then enjoy leftovers for breakfasts the next few days. Pinned! Hello Becky! We had sent you a product review inquiry but did not receive any reply from you. So we have sent it again today since it might have gone to your spam box. We would greatly appreciate if you get back to us and tell us what you think about our offer. Thanks!